Was hoping to finish riveting both the right and left seat floor assemblies onto the center section but that was not the case due to a late start in the shop from running errands and a long overdue mowing of the lawns. None the less, progress was made and the right seat floor assembly was successfully attached onto the fuselages center section. Quite a bit of time was spent pondering just how to go about completing the task of attaching the seat floor assemblies by myself … ultimately decided to lay the center section on its side. A bungee cord was hung down from the rafters as insurance to prevent the assembly from accidentally falling over while riveting. Securing the right seat floor assembly onto the center section’s forward bulkhead with Clecos. The center section seemingly balanced nicely on its own, but the addition of the bungee cord visible in the above photo worked well. After the Clecos were in place, the F-1225 seat floor was riveted onto the center section. Most of the rivets were done with the pneumatic rivet puller, but a few required the use of the hand rivet puller. Using the pneumatic rivet puller to rivet the F-1225R seat floor onto the center section. Following standard convention, since the F-1215 ribs are of a thinner material than the center section’s forward bulkhead, the factory heads of the rivets were placed on the flanges of the F-1215 ribs. This worked for all but the uppermost rivet on each rib so that rivet went in from the center section side of the forward bulkhead. All the rivets attaching the F-1215 ribs to the fuselage’s center section required the trick of bending the mandrels and using the AEX wedge to gain clearence for the rand rivet pullers. The rivets that needed to go in from the center section forward bulkhead side required the use of the Stanley swivel head hand riveting tool. Riveting the flanges of the F-1215 ribs onto the center section using the close quarter hand rivet puller. The miner’s light really helped a lot so the rivets could be seen behind the AEX wedge to verify the rivets were square before setting them. Of note: Last summer my friend Kurt and I were wandering through a Home Depot and Kurt grabbed up an LED light that sits on your head like a miners light. 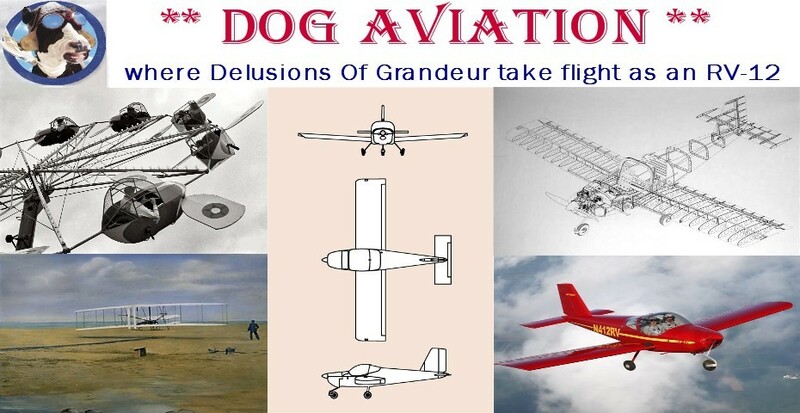 Kurt said “this will come in handy for your project” and bought it for the DOG Aviation shop. Because the lighting in the shop is plentiful, I’ve not had the need to use it much … mostly just for trying to find items dropped on the floor. I’ve needed it a few times now in the last couple of weeks and it was really handy to have agatn today. When riveting with the AEX wedge, it can be very difficult to see the heads of the rivets because you have to look behind the wedge to see if it is square on the rivet. The miner’s light really has come in handy to eliminate the shadows and allow the rivets to se seen clearly. Thanks Kurt! The right seat assembly is now permanently attached onto the RV-12’s center section forward bulkhead. With the attachment of the seat floor assembly onto the center section, the fuselage assembly instantly just got big. Tomorrow the plan is to attach the remaining left seat floor assembly onto the center section and hope it goes as smoothly as the right assembly did.